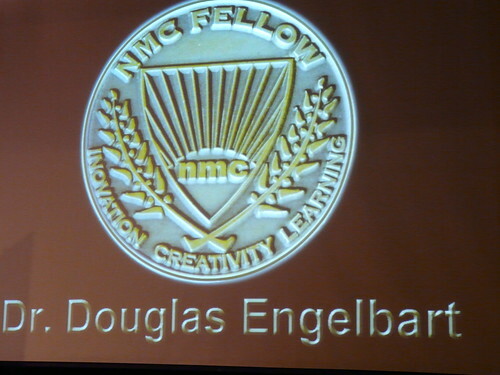 Commemorating the presentation of the NMC Fellows Award to Doug Engelbart at the NMC Summer Conference. This piece excerpted for our Guest Author Series with permission from “NMC 2009 Closing Plenary: Dreams About How The World Could Be, by Gardner Campbell June 17, 2009. The sense of expectancy, of sheer possibility generated at a meeting like this make me so hopeful that we can be a force for positive change, that we can reach the transformative moment. That we can bootstrap ourselves into a better world. Now Larry Johnson has begun the tribute to Doug Engelbart. His testimony moves me deeply. He plays excerpts from a videotaped interview he did with Doug about ten years ago. As always, the clarity and poetry of Doug’s vision take my breath away. I’ve got to stop typing now. The rest here is from memory, as I was too overcome with emotion on that morning to write another word as the tributes rang out. Lev Gonick, VP for Information Technology Services at Case Western Reserve University, and Kristina Woolsey, NMC Fellow and head of Woolsey & Associates, lead Doug onto the stage. The room is instantly on its feet, applauding and cheering. 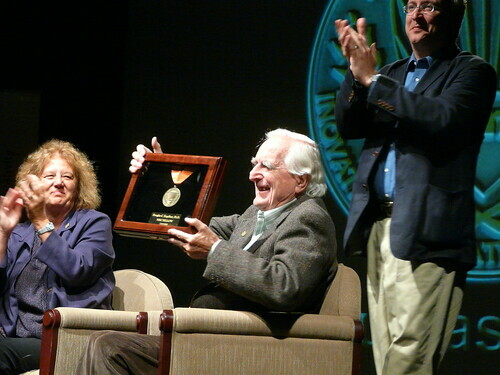 How many times does one get to thank, face to face, the inventor and visionary who has made a new vocation possible? For the work we do is a vocation, a calling, and we hear the voice of that calling through the stubborn insistence of this man’s efforts. As we continue, quite rightly, to identify and even to rail against what’s breaking and broken in our schools, it is good also to see and remember what school at its best can be, and is: a means of augmenting human intellect, a place for bootstrapping, a place for hearts and minds to work and play together. School’s not the only place that happens. But it can happen there, and I want to help make it happen there–to preserve the fragile magic that rests upon a flawed but vital infrastructure. 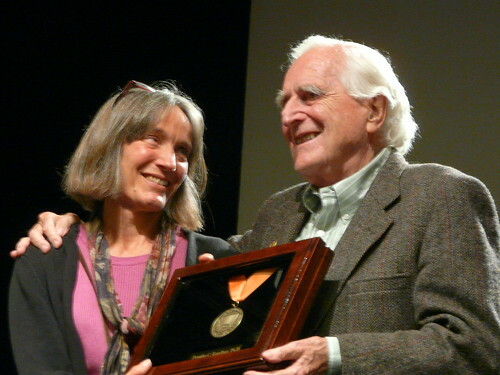 In 1962, Doug Engelbart, the father of interactive computing, published a seminal essay called “Augmenting Human Intellect: A Conceptual Framework.” The essay impressed one J.C.R. Licklider, the father of the Internet, who set Doug up with a research lab that would help bring the information age into being. Doug was called many names during his years leading the Augmentation Research Center. Some were flattering, but many were not. He was thought by many to be (not to put too fine a point upon it) off his rocker. One early colleague warned him quite explicitly not to share his vision with anyone else lest he be fired or completely marginalized. This we know from the awed testimony of his colleagues’ speeches at last December’s celebration of the fortieth anniversary of the Mother of All Demos. Those colleagues testified to the awe they continue to feel of Doug and his achievements. They are awed by Doug’s persistence, awed by how wrong his critics were, awed to know and to have worked with someone who despite “the loneliness of the long-distance thinker,” as Howard Rheingold so aptly put it in Tools for Thought, fought through the isolation and misunderstanding and, yes, at times even antagonism and hostility, to keep his vision alive and aloft. The ovation continues as Lev and Kristina and Doug settle into their chairs at center stage. Finally, the applause subsides, and Lev and Kristina begin to speak. They speak of Doug’s accomplishments. 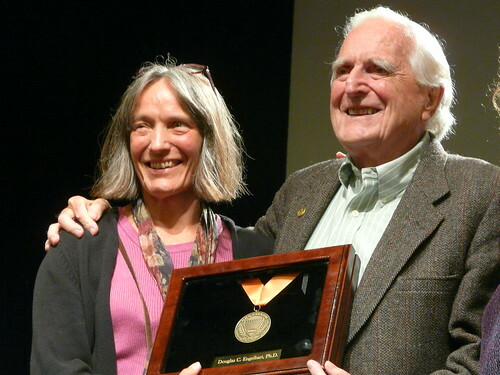 They recall what it was like to discover Doug’s writings, many years into their own careers, and to read their futures in the work of his heart, hands, and mind. Lev and Kristina help us understand the scale and significance of Doug’s vision. They look at him with affection, with respect. With wonder. Several times Doug covers his face in genuine humility. Can he be the person they’re describing? Certainly he did not do his work alone. But of all the great seers and doers of the nascent information age, Doug’s achievement is the most singular, the most to be driven by a single imagination. And yet his imagination was never the point. Always, the goal was to enable us to identify, harness, and raise our collective IQ. The idea was to augment human intellects one by one, but by means of a fine tracing of mental and spiritual connections from which would emerge a true “capability infrastructure” to prepare us for the dangers, questions, and opportunities we would encounter as civilization continues to develop and evolve. Doug thought at scale. He understood that a car is not simply a faster tricycle. He had faith that an augmented intellect, joined to millions of other augmented intellects, could clarify individual thought even as it empowered vast new modes of thinking, new modes of complex understanding that could grasp intricately meaningful symbols as quickly and comprehensively as we can recognize a loved one’s face. For Doug, computers are the tools we have invented in our quest for a new language, even a meta-language. A manner of speaking that can move us through the enmiring complexities of our shared lives and dreams, and thus help us to use those complex lives and dreams wisely instead of being their puppets or victims. Lev has spoken; Kristina has spoken. Now it’s Doug’s turn. Well this is, you know, a trite thing to say, “I’m overwhelmed,” but I sit here just feeling overwhelmed. You know, I wasn’t doing all of those things in order to sit here and get something like this. It’s been so many years … and I still have dreams about how the world could be … anyway, I appreciate this very much, so thank you, thank you. 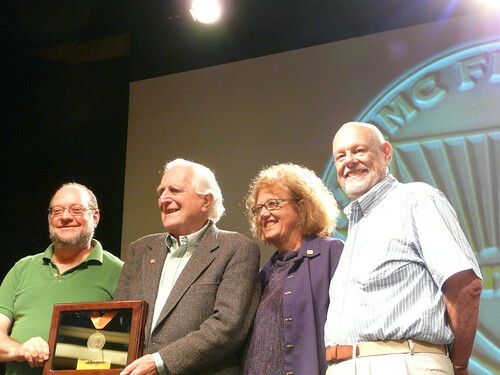 The four NMC Fellows: (l-r) Ted Kahn, Doug Engelbart, Kristina Woolsey, Carl Berger. About the Author: Guest author Gardner Campbell, Baylor Professor and New Media Consortium (NMC) Board Member, has an uncanny sense of articulating with poetic sincerity the very core of Doug’s vision and passion. This piece was excerpted from Gardner’s Blog entry “NMC 2009 Closing Plenary: Dreams About How The World Could Be” posted on Wednesday, June 17th, 2009 at 11:41 am. His honors course From Memex to YouTube: An Introduction to New Media Studies was the inspiration for the Doug Engelbart Institute establishing its Student Showcase. You can find Gardner’s blog for more great articles about Doug and our work. I loved reading this blog and seeing the wonderful photos of Doug et al. It’s wonderful to see so much of the vision that Doug has held for so very long, becoming a reality. Yet, there is so very much to do and quickly, on behalf of us mortals. Do we have meaningful efforts in developing Collective IQ within the US schools, system-wide yet? I’m embarrassed to say that in the 90’s I attempted to introduce an educator to Doug, whom I thought could understand the notion and importance of Bootstrapping, but, sadly, he fell into the huge group of people who didn’t “get it.” I’m an old friend, and glad that Doug and Christina are keeping up the good work. We have to all keep it moving quickly in the directions that result in the betterment rather than the destruction of mankind. Thank you for the info in the blog.